Champion Chart Supply offers a full range of medical patient charting products like Paper Charting Ringbinders, Chart Dividers, Charting labels, Medical Chart Folders and Filing Products. 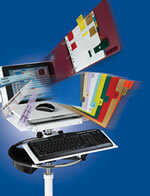 We are leaders is EMR chart storage, Mobile computer carts, workstations, and much, much more. In addition to the highest quality medical charting products available, Champion Chart Supply is dedicated to a level of service that has earned us a reputation for being easy and comfortable to deal with, something we value greatly and which we do everything possible to maintain. See why our customers have come to know Champion Chart Supply as the leader in medical patient charting products. Call us today and give us an opportunity to earn your business!